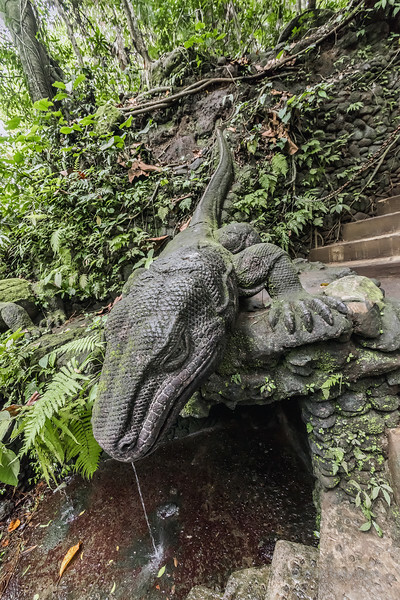 A realistic looking carved stone statue of a Komodo dragon lurks by a stream in the Sacred Monkey Forest Sanctuary, Ubud, Bali. The small stream of water appearing to come from its mouth is an illusion from how I framed the shot as it actually comes from the small cliff behind the statue. The dragon looks pretty realistic, and the photo trick with the water makes it really fun. Very creative capture, well seen! Great find. Very nice statue. It looks very realistic...great pov! Wow, at first look, I thought it was real. Great capture.